I learned the power of love, the kind that you leave home and cross oceans for years after it starts, and again and again because the way he speaks is so sweet that it is enough for you to change your name and nationality and it doesn’t really matter where or when the love asks you to go. I felt the pain that comes with wanting something to work, the shame that comes with saying words you can’t take back, and the quiet bravery needed to walk away when it doesn’t. Love can always continue in a different form, it doesn’t necessarily have to die but instead has the ability to transform into friendship or a memory you hold somewhere deep in your heart. Not all love is meant to last. I learned the holy tenderness of love without intimacy, and how it can save your soul, and the aridity that is intimacy without love, especially when a betrayal. I lived in the collective comfort of community, cooking meals for 8 who sat together to eat each and every meal made of vegetables grown from their own hands and lands. I lived autonomously, aware of the independence that is crossing continents alone, of hiking to the top of Kilimanjaro and wanting to share that sunrise with everyone or a special one but instead taking it in all on your own. I learned the joy of new friends in new places, the gratitude for find new homes, and the indescribable event of coming home to be greeted by your entire past…except for the one you come to mourn. Learning to lose a father is a lesson I would gladly pass on for 10 or 20 years to come, but learning to be responsible, to have grace in the face of tragedy, and the absolute strength of community is what I have to move forward with instead. I tested friendships, and gratefully found those most sacred are always built to last. I played with my body, leaning into the spiritual glow that comes with being vegan, and the indulgent pleasure that’s worth cracking it for over an 8-course tasting meal. I love the obedience of twice a day workouts as much as the more natural flow of unplanned hikes. I practiced yoga every day for a week with Carly and Mom. I failed at being a farmer’s wife but found I might be decent at being a writer and I can create. I took the idea of a documentary and directed, wrote and produced it into a 10-minute video which I’m hardly proud of except for the proof that I could probably do it again, and better, with a team. I am learning discipline and deadlines and the confidence that come with getting your books in order. I met creatives, young men and women who were so open with their art and their ambition and their desire to be good that it made my heart break although I never said a word, afraid that to name it might change it. I meditated in a Buddhist monastery, watched waves break in Montauk. Climbed to the top of Montserrat and Kilimanjaro and felt the power of the swimming in the seas of my three favorite places. I kept meeting with an old love, convinced that this might be the time we really reconnect, only to realize what we had was gone long ago and any time is an okay time to let go. Barcelona to New York. Breckenridge to Bordeaux. Oslo to Milan and back to Cataluña again. Kilimanjaro and Cape Town and Kruger National Park. The Serengeti. Ethiopia. New York. Costa Rica. Today, again in what will always be my first home, New York. It wouldn’t be enough to name the places I’ve been, because that wouldn’t tell the stories of the love or the loss and the magic moments whether they be the kisses next to crashing waves or the old school acoustic sessions in empty bars found in between it all. It wouldn’t put the sweet words I didn’t know how say into the ears for the one I was too shy to risk them on, and it wouldn’t erase what I said to those vulnerable to my pain. It wouldn’t tell you that I once traveled 30 hours, running through airports and continents and driving cars through the middle of the night to get home to a city I only days earlier pledged to trade in for more adventures through the continent of my dreams. It wouldn’t give me the chance to say goodbye. All I really know is what you are seeking is seeking you so keep going and growing and loving and losing it all in pursuit of what is real and honest and magic. In the folds of time, I remembered that indelible truth: That women coming together are what have and always will move us forward. 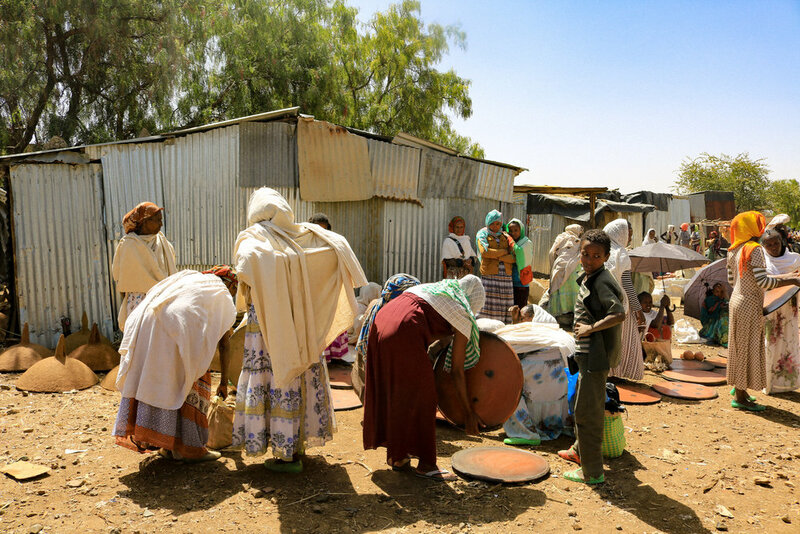 This photo was taken at the Saturday morning market in Aksum on the day before the Orthodox Easter. Women sold their beans and spices, traded chickens for tea, and chatted in circles while protecting themselves from the rising sun. A kingdom at the crossroads of the three continents, Aksum was once the most powerful state between the Eastern Roman Empire and Persia. It was the heart of ancient Ethiopia and a Biblical city where many believe the original Ten Commandments still sits today. Often overlooked in comparison to Rome and Jerusalem, Aksum's vibrant history can be considered a lost civilizations and one well-worth looking into. “Don’t just be writers. Be firefighters, policemen, teachers, doctors, chemists, electricians, but don’t just be writers." "Being writers and only writers meant you would be stuck in the corral, communing only with the other ponies, when you should be exploring the world beyond the enclosure," explains Nell Boeschenstein in Scratch: Writers, Money and the Art of Making a Living -- compiled by Manjula Martin. An amazing book for anyone interested in making art. The sun moves differently around the farm. It moseys in slowly, taking its time behind the dew, waiting for the rooster to tire after its morning call. It comes in clean, from a good night’s rest, so when it does arrive, it is fully present, lighting up the pink rose petals that flank the front door and the tiny green buds that it will bake into almonds come September. We would let the morning sun arrive in solitude, while still wrapped in bed, only blinking our eyes to greet its brilliance once it was well above the horizon. Being a farmer in Spain doesn’t follow the same rules as places where they are washed and fed by the sun’s first shimmer. Our bare feet hit the wood floor, and a tanned hand pulls the heavy shade away. The eyes adjust, and afterwards, you do not see the sun at all, but the kingdom it alights. The rolling hills that lead to the sea. The mountain range fortifying that blessed land from behind. The greenhouse built with the gentle Austrian's hands, and the baby trees held high with stick and string. The vines are pregnant with grapes ready to slide in between your teeth. Your mouth finds mine for a morning kiss and the day begins. From the Moon to the Sea. In Costa Rica, we placed an object on an alter to infuse with the good vibes from yoga, meditation and women's circles. I put a necklace of the moon that I wear every day since leaving Barcelona as well as a stone from the summit of Kilimanjaro and a seashell from the sands of South Africa. Only later in the week, blissed out on breath work, did I see the stone and shell representing that holy contrast of ying and yang, masculine and feminine, the strength of the mountain and the fluidity of the sea. The Sacred Self-Care Yoga Retreat was hosted by my sister Carly. She is hosting another one in October 2018! The clarity breath work was led by Avani Gilbert at Om Cashew Hill. You can find breath work practitioners near you here. The necklace is from Flora y Fauna - a conscious Catalan line of handcrafted jewelry inspired by nature. Photograph taken by Michael Waidmann. Under a Million Stars That You'd Soon Join. I didn't know in the early hours of April 8 that I was looking up at the million stars you'd soon join.